The JSON-RPC 2.0 Shell is a neat tool for rapid examination, testing and demonstration of remote JSON-RPC 2.0 web services. Developers will greatly appreciate its time-saving benefits - no more tedious typing of one-off scripts - just point it to the desired server URL and you will be presented with an interactive shell where you can enter your JSON-RPC commands and inspect the responses. 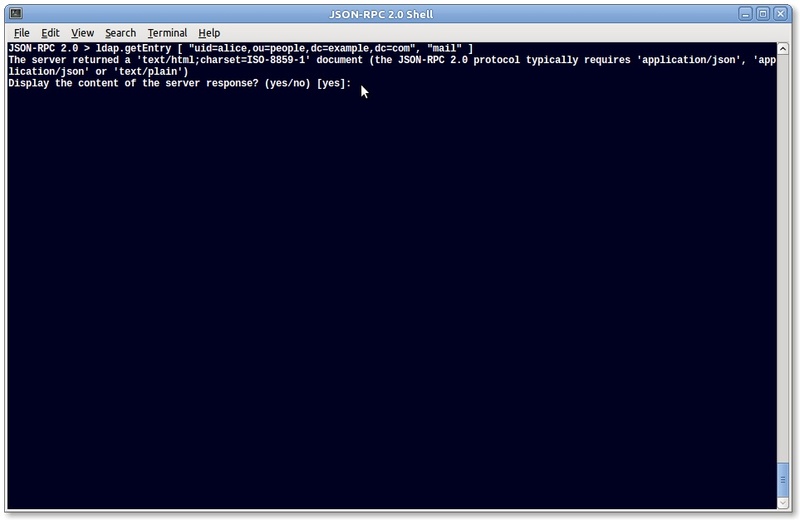 The JSON-RPC 2.0 Shell can be launched from your Windows/ Linux/ Mac OS X CLI and provides typical shell features, such as the ability to browse and edit your JSON-RPC request history. There's also an auto ID option to save typing. And, of course, verbose RPC exception reporting and diagnostics. All in all, a must-have tool for developers undertaking serious JSON-RPC 2.0 work. JSON-RPC 2.0 > getStockQuote ["AMZN"] "id-001"
Important: If you omit the request ID (set to "id-001" in the above example) the JSON-RPC 2.0 protocol treats the call as a notification and no response will be returned by the server (including errors). If you leave the ID out the shell will remind you by printing "[Notification]" after the command. To save repeated typing of IDs start the shell with the -a, --auto-id option (see startup options). JSON-RPC 2.0 > getForexQuote ["EUR"] "id-002"
If the method accepts parameters, whether positional (JSON array of ordered parameter values) or named (JSON object consisting of parameter key/value pairs), these are specified in their original JSON format. JSON-RPC 2.0 > addNumbers [10,20] "id-001"
JSON-RPC 2.0 > [10,20] addNumbers "id-001"
server_URL The URL of the remote JSON-RPC 2.0 server. -a,--auto-id request_ID Specify a request ID to be appended automatically to each outgoing RPC message. Use this option to save repeated typing of request IDs in the RPC shell. -n,--no-strict Disable checking of the "jsonrpc" version field in RPC responses and checking of the content type header (for matching application/json or text/plain) in HTTP responses. Use this option to allow limited compatibility with older JSON-RPC (1.0) servers. -o,--origin origin_URL Append an "Origin" HTTP header with the specified value to the outgoing requests. Use if the remote web service requires Cross-Origin Resource Sharing (CORS) support. -p,--pretty compact|regular|off Apply pretty JSON formatting to JSON-RPC 2.0 response results. The default style is compact. You may also select regular pretty formatting or disable it entirely with off. -s,--stopwatch Displays the time it took each entered JSON remote procedure call to complete (in micro / milliseconds). Use it to measure execution speed and transport delay / latency. -t,--trust-all Allow self-signed X.509 certificates presented by the web server. -v,--verbose Print the JSON payload of each incoming and outgoing RPC message. Additional status information may be displayed too. -h,--help Display a short help text about the shell usage. For each JSON-RPC 2.0 request a message identifier must be specified. Typing IDs, however, can become tedious after a while. A convenient solution is to start the shell with the -a / --auto-id option and specify an ID value to be automatically appended to each outgoing message. The above example sets a default ID of 123 (integer). Now you only have to enter the method name and the parameters (if any). The client will then complete the request by appending the preset ID. Note that with this option you cannot enter notifications. But you can still override the default request ID by specifying an explicit value at the prompt. The -s, --stopwatch option turns a stopwatch for each outgoing JSON-RPC 2.0 request. It then shows how long it took to receive the response, in micro / milliseconds. Note that the recorded time represents the time for the server to process the request as well as the times the RPC messages spent in transit. "mobile" : "0755 123 500 353"
The JSON-RPC 2.0 shell can also access HTTPS URLs. HTTPS encrypts traffic to the web service and also provides a mean to verify its identity. Note that web servers typically accepts SSL/TLS connections on a different port than the standard 80 for plain HTTP. This may be port number 443 (the well-known port for HTTPS) or some other dedicated port, and that you may need to specify its number explicitly as shown above. If you open an HTTPS URL and get a security exception that looks like this it could mean that the web server presented a self-signed certificate or a certificate signed by an unknown certificate authority (CA). The default policy of Java is to allow HTTPS connections only if the web server presented a valid certificate signed by one of the "official" root CAs such as Verisign or Thawte. Simply start the shell with the -t, --trust-all option to disable certificate issuer checking. This option is intended for testing and development purposes where you need a quick switch to test encrypted SSL access. Import the server certificate and/or the certificate of the issuing CA into a custom trust store file and then make its details available to Java. Java comes with a standard keytool command line utility for creating and editing trust/key stores. Alternatively you may use a friendlier GUI tool such as the KeyStore Explorer from Wayne Grant. 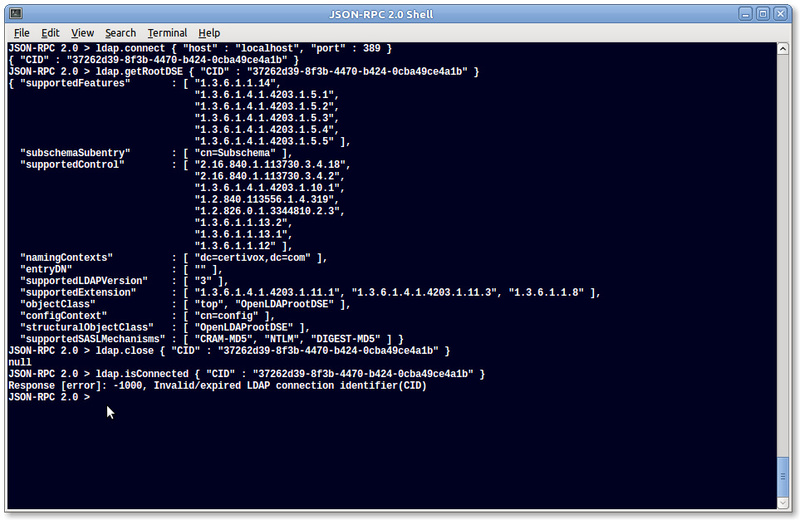 The JSON-RPC 2.0 shell has a readline-like interface. One useful feature is the ability to browse through the command history to edit and resend previously entered requests. To do that use the Arrow-Up and Arrow-Down keys on your keyboard. Once autocomplete is enabled you can press [Tab] at the start of a new request to see the available JSON-RPC method names. Future versions will include intelligent autocomplete where all entered method names that complete successfully will be automatically added to the autocomplete list. The JSON-RPC 2.0 Shell is offered under a simple and affordable paid license. The source code is also supplied so the software can be freely modified. The JSON-RPC 2.0 specification and user group can be found at http://groups.google.com/group/json-rpc. This shell tool uses the JSON-RPC 2.0 Base library (also hosted here). It provides a simple and robust Java implementation of the protocol for the correct creation, serialisation and parsing of JSON-RPC 2.0 messages. User friendly error messages on bad parameter input. Removes scalar restriction on positional and named parameters. Switches to JSON.simple toolkit for parameter parsing. Upgrades JsonRpc2-Base JAR to version 1.4. Fixes HTTP content type header validation if a charset name is appended. Upgrades JsonRpc2-Base JAR to version 1.9.1. Allows for "text/plain" HTTP reponse content type alongside "application/json" and "application/json-rpc". Upgrades JsonRpc2-Base JAR to version 1.10. Adds an "Origin" HTTP header option for outgoing requests (for web services requiring Cross-Origin Resource Sharing (CORS) support). Upgrades JsonRpc2-Base JAR to version 1.11. Adds pretty JSON formatting to JSON-RPC 2.0 results. Uses external JSON-RPC 2.0 Client 1.1 library for RPC sessions. Uses external PrettyJson 1.0 library for JSON result formatting. Upgrades JSON-RPC 2.0 Base JAR to 1.14. Adds -p,--pretty (compact|regular|off) command line option. Adds -t,--trust-all command line option. Allows "jsonrpc" version check to be disabled via the existing -n,--no-strict option. Adds -s,--stopwatch command line option to measure response time. Upgrades JSON-RPC 2.0 Base JAR to 1.16. Upgrades JSON-RPC 2.0 Base JAR to 1.19. Adds support for displaying non-standard attributes in JSON-RPC 2.0 responses. The -s,--stopwatch command line option also prints the server request processing time if reported through a non-standard "xProcTime" attribute. Upgrades JSON Smart JAR to 1.0.9. Upgrades JSON-RPC 2.0 Base JAR to 1.21. Upgrades JSON-RPC 2.0 Client JAR to 1.5. Upgrades Pretty JSON JAR to 1.1. Adds support for HTTP cookie handling, to accommodate JSON-RPC servers that use out-of-channel cookies for session management. Improves reporting of network exceptions. Upgrades JSON-RPC 2.0 Client JAR to 1.6. Upgrades JSON Smart JAR to 1.0.9-1. Upgrades JSON-RPC 2.0 Base JAR to 1.24. Adds JSON-RPC method name autocompletion. Upgrades JSON Smart JAR to 1.1.1. Upgrades JSON-RPC 2.0 Base JAR to 1.25.1. Upgrades JSON-RPC 2.0 Client JAR to 1.7.1. Upgrades JSON-RPC 2.0 Base JAR to 1.27. Upgrades JSON-RPC 2.0 Client JAR to 1.7.2. Upgrades JSON-RPC 2.0 Base JAR to 1.30. Upgrades JSON-RPC 2.0 Client JAR to 1.9. Switches project build from Ant to Maven. Upgrades to JSON-RPC 2.0 Base 1.34. Upgrades to JSON-RPC 2.0 Client 1.14. Upgrades to Pretty JSON 1.4.